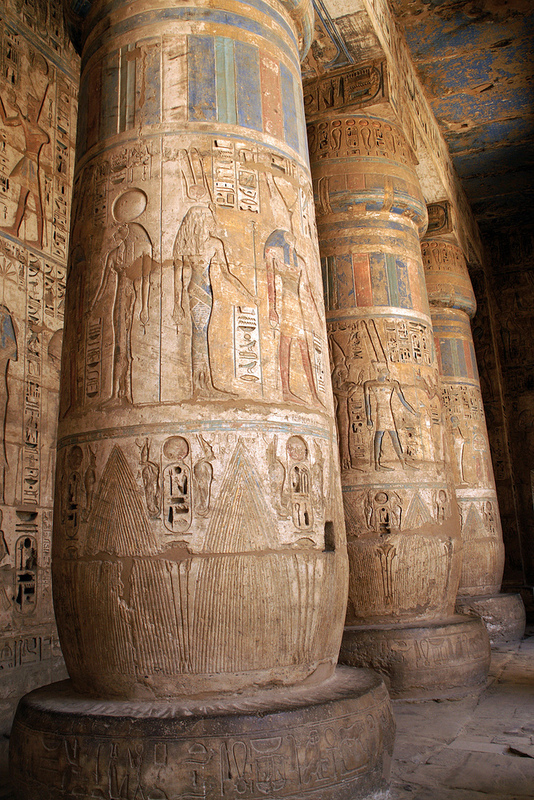 The ancient Egyptians had a great appreciation for life which is clearly depicted through their art. Images of people enjoying themselves – whether in this life or the next – are as plentiful as those most often seen of the gods or funerary rituals. The early Egyptologists who first encountered the culture focused their attention on the many examples of funerary art found in tombs and concluded that Egyptian culture was death-obsessed when, in reality, the ancient Egyptians were wholly absorbed in living life to its fullest. Colour was regarded as an integral element of all art representations, including wall-scenes, statuary, tomb goods, and jewelry, and the magical qualities of a specific color were believed to become an integral part of any object to which it was added. Color in ancient Egypt was used not only in realistic representations of scenes from every life but to illustrate the heavenly realms of the gods, the afterlife, and the stories and histories of the deities of the Egyptian pantheon. Each color had its own particular symbolism and was created from elements found in nature. Egyptologist Margaret Bunson writes how “artisans began to observe the natural occurrence of colors in their surroundings and pulverized various oxides and other materials to develop the hues they desired” (54). This process of Egyptian artists creating colors for their art dates to the Early Dynastic Period (c. 3150-c. 2613 BCE) but becomes more pronounced during the time of the Old Kingdom (c. 2613-2181 BCE). 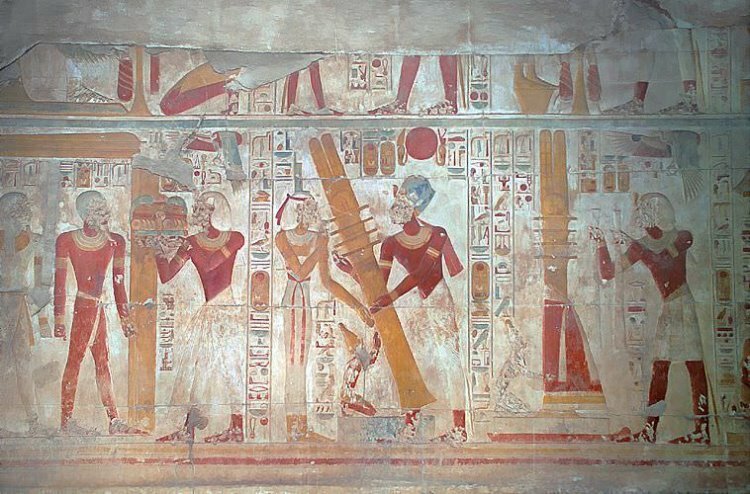 From the Old Kingdom until the country was annexed by Rome after 30 BCE, color was an important component of every work of art fashioned by the Egyptians. Each color was created by mixing various naturally occurring elements and each became standardized in time in order to ensure a uniformity in art work. 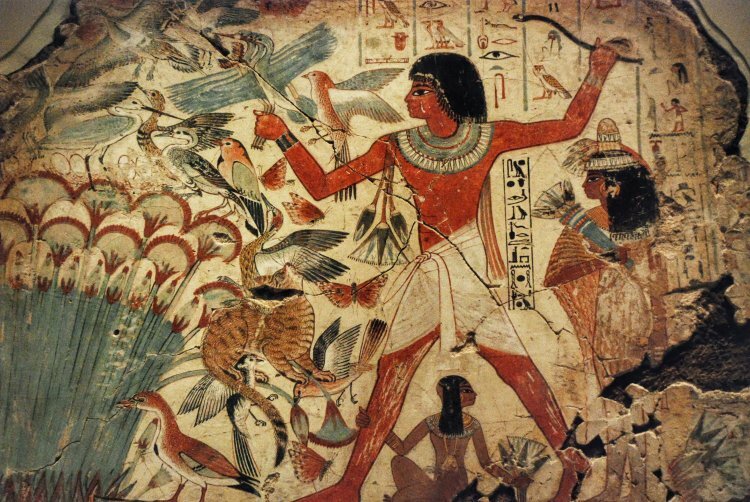 An Egyptian male, for example, was always depicted with a reddish-brown skin which was achieved by mixing a certain amount of the standard red paint recipe with standard brown. Variations in the mix would occur in different eras but, overall, remained more or less the same. 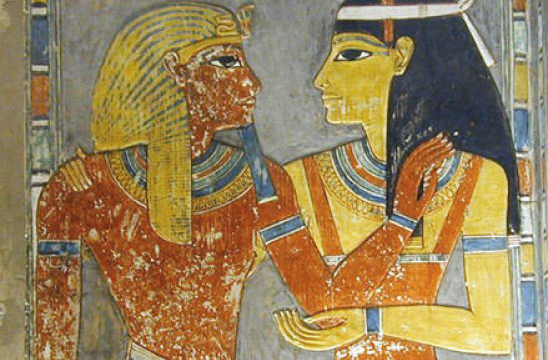 This color for the male’s skin was chosen for realism in the piece, in order to symbolize the outdoor life of most males, while Egyptian women were painted with lighter skin (using yellow and white mixes) since they spent more time indoors. The different colors below are listed with their Egyptian name following, the materials used in creating them, and what they symbolized. The definitions follow the work of Richard H. Wilkinson in his Symbolism & Magic in Egyptian Art and Margaret Bunson’s Encyclopedia of Ancient Egypt, supplemented by other works. A scene from the Hall of Osiris at Abydos which shows the raising of djed pillars, symbols of stability. Red (desher) – made from oxidized iron and red ocher, used to create flesh tones and symbolizing life but also evil and destruction. Red was associated with both fire and blood and so symbolized vitality and energy but could also be used to accentuate a certain danger or define a destructive deity. The god Set, for example, who murdered Osiris and brought chaos to Egypt at the beginning of time, was always represented with a red face or red hair or completely in red. One also sees this pattern in written work where the color red is sometimes used to signify a dangerous character or aspect in a story. 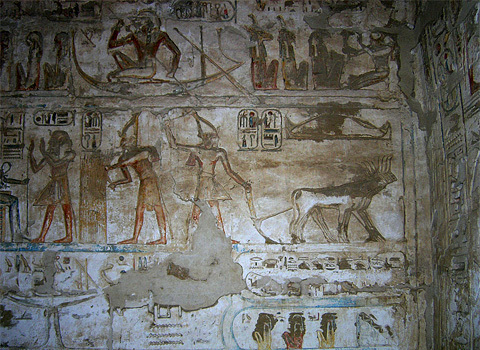 In wall paintings and tomb scenes red must be carefully interpreted within the context of the scene. Although it was frequently used for emphasis of danger or even evil, it is also as commonly seen symbolizing life or a higher being (as in depictions of the Eye of Ra) or elevated status as in the Red Crown of Lower Egypt. 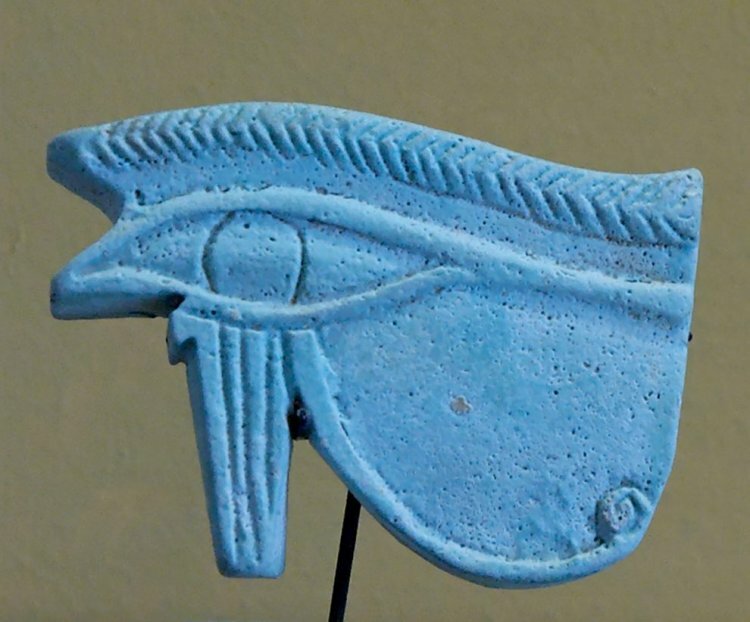 Blue (irtiu and khesbedj) – one of the most popular colors, commonly referred to as “Egyptian Blue”, made from copper and iron oxides with silica and calcium, symbolizing fertility, birth, rebirth and life and usually used to depict water and the heavens. Wilkinson writes, “by the same token, blue could signify the river Nile and its associated crops, offerings, and fertility, and many of the so-called `fecundity’ figures which represent the river’s bounty are of this hue” (107). Statues and depictions of the god Thoth are routinely blue, blue-green, or have some aspect of blue in them linking the god of wisdom with the life-giving heavens. Blue also symbolized protection. Fertility amulets of the protector-god Bes were often blue as were the tattoos women would wear of Bes or diamond-shaped patterns on their lower abdomen, back, and thighs. It is thought these tattoos were worn as amulets to protect women during pregnancy and childbirth. Yellow (khenet and kenit) – made from ocher and oxides originally but, from the New Kingdom (c. 1570-1069 BCE) was mixed from arsenic trisulphide and symbolizing the sun and eternity. Yellow was darkened for the golden flesh-color of the gods or lightened with white to suggest purity or some sacred aspect of a character or object. Isis, for example, is always depicted with gold skin in a white dress but, sometimes, her dress is a light yellow to emphasize her eternal aspect in a scene or story. It is thought that priests and priestesses of the gods of Egypt would sometimes dress as their deities and Wilkinson suggests that priests of the god Anubis would color their skins yellow on certain occassions to “become” the god for the event. Although Anubis was traditionally represented as black-skinned, there are a number of texts depicting him with the golden hue of the other gods. Green (wadj) – mixed from malachite, a copper mineral, and symbolizing goodness, growth, life, the afterlife, and resurrection. The Egyptian afterlife was known as The Field of Reeds and, in some eras, as The Field of Malachite and was always associated with the color green. Wilkinson writes how green was “naturally a symbol of growing things and of life itself” and goes on to point out how, in ancient Egypt, “to do `green things’ was a euphemism for positive, life-producing, behavior in contrast to `red things’ which symbolized evil” (108). Green is the color of the dying and reviving god Osiris and also of the Eye of Horus, one of the most sacred objects in Egyptian mythology. In early tomb paintings the spirit of the deceased is shown as white but, later, as green to associate the dead with the eternal Osiris. In keeping with the symbolism of ressurection, green is also often used to depict the goddess Hathor, Lady of the Sycamore. Hathor was closely associated with the Sycamore tree, with renewal, transformation, and rebirth. Mummies of tattooed women suggest the ink could have been green, blue, or black and tattoos have been linked with the worship of Hathor. White (hedj and shesep) – made from chalk mixed with gypsum, often employed as a lightener for other hues, and symbolizing purity, sacredness, cleanliness, and clarity. White was the color of Egyptian clothing and so associated with daily life but was frequently employed in artistic pieces to symbolize the transcendent nature of life as well. Priests always wore white and so did temple attendants and temple personnel taking part in a festival or ritual. The objects used in rituals (such as bowls, plates, altars, tables) were made of white alabaster. White, like the other colors, was used realistically in depicting clothing and objects of that color in real life but frequently is employed to highlight the importance of some aspect of a painting; in some cases, it did both these things. The White Crown of Upper Egypt, for example, is routinely referred to as white – and so is realistically depicted – but also symbolized the close connection to the gods enjoyed by the king – and so symbolically represents purity and the sacred. Black (kem) – made from carbon, ground charcoal, mixed with water and sometimes burnt animal bones, symbolized death, darkness, the underworld, as well as life, birth, and resurrection. 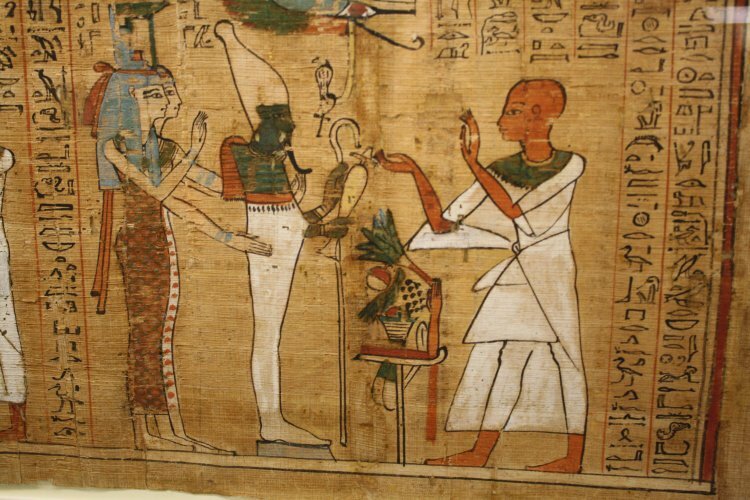 Wilkinson writes, “the symbolic association of the color with life and fertility may well have originated in the fertile black silt deposited by the Nile in its annual flooding and Osiris – god of the Nile and of the underworld – was thus frequently depicted with black skin”. Black and green are often used interchangably in Egyptian art, in fact, as symbols of life. Statues of the gods were frequently carved from black stone but, just as often, from green. Although black was associated with death it had no connotation of evil – which was represented by red – and, frequently appears along with green, or instead of green, in depictions of the afterlife. Anubis, the god who guides the dead to the hall of judgment and is present at the weighing of the soul’s heart, is almost always depicted as a black figure as is Bastet, goddess of women, one of the most popular deities in all of Egypt. Tattoos of Bes were done in black ink and images of the afterlife frequently make use of a black background to not only accentuate the gold and white of the foreground but also symbolize the concept of rebirth. A pharaoh was known primarily by his throne name. 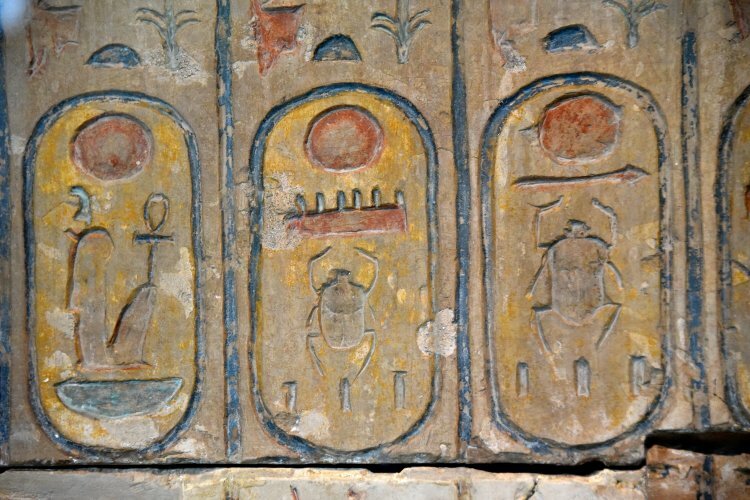 This was traditionally a statement about his divine father, the sun-god Ra, so all cartouches with throne names display a sun-god at the top. A king’s birth name was the only name he had already as a prince and is preceded by the epithet “son of Ra”. Rulers deemed unimportant or illegitimate, including ruling queens, have been omitted from this list. In 1851 CE, a woman named Amelia Bloomer in the United States shocked the establishment by announcing in her publication The Lily that she had adopted the “Turkish Dress” for daily wear and, further, provided readers with instructions to make their own. This “Turkish dress” was a pair of light-weight pants worn under a dress which dispensed with the heavy petticoats and undergarments which constituted women’s fashion. At the time of Bloomer’s announcement, upper-class women were wearing dresses comprised of as many as 16 petticoats, which were quite heavy, and those of the lower classes were almost equally constrained. These ‘Turkish’ pants (which came to be known as ‘bloomers’) emancipated women from the constraints of fashion, allowing them freedom of movement, and became one of the symbols of the new women’s suffrage movement. The Women’s Suffrage Movement had only just met to issue their Declaration of Rights and Sentiments, written by Elizabeth Cady Stanton, in 1848 CE at Seneca Falls, NY, and Bloomer’s advocacy of the new style was embraced by one of the pivotal figures of the movement, Lucy Stone, who wore the pants during her lectures on women’s rights. It was Lucy Stone who would encourage Susan B. Anthony to take up the cause of the women’s suffrage movement and Anthony, of course, is now synonymous with women’s rights. All of these challenges to the patriarchy of the 19th century CE were quite disturbing, to women as well as men, but they would have been nothing startling to the ancient Egyptians who viewed women as equals and whose fashion sense was nearly unisex long before that word, or concept, was understood by the more ‘advanced’ culture of the present day. 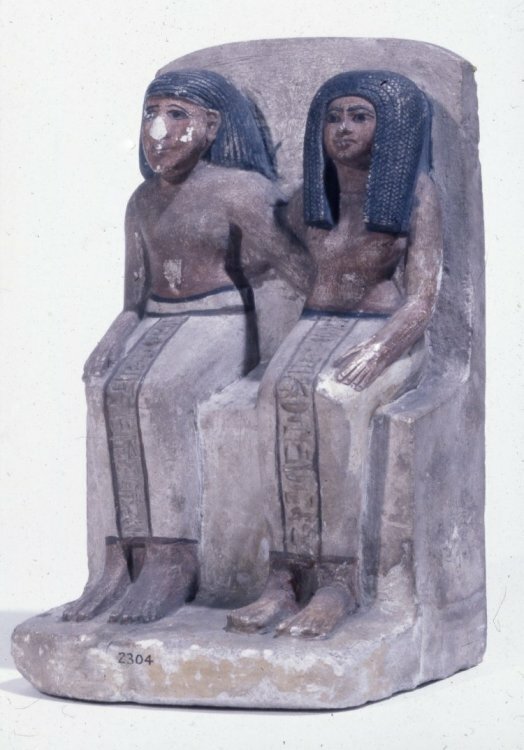 Limestone statue of Pashedu and his wife Ruiu: the two figures are seated on a high-backed chair, each with one arm resting on the far shoulder of the other. Pashedu wears a long braided wig and a long skirt. Ruau wears a long braided wig and a long tight-fitting dress. The inscriptions are incised on the front of the garments of the two figures and on the back of the chair, which is in the form of a round-topped stela. In the arch are two ‘wedjat’ eyes. The monument is in an excellent state of preservation. Much of the original paint is still visible: black on the wigs, and red on the bodies, fringes of garments and border lines of the front inscription. Egyptian fashion was practical, simple, and, for most of the population, the same kind of outfit worn by a woman was worn by a man. The upper-class women in the Old Kingdom of Egypt (c. 2613-2181 BCE) wore longer dresses which covered their breasts, but the women of the lower classes would have worn the same simple kilt as their fathers, husbands, and sons. 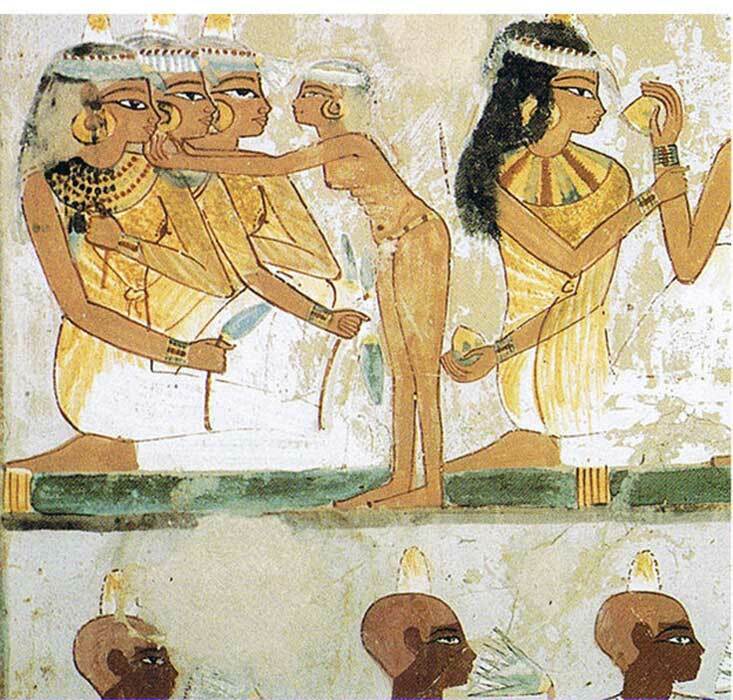 Images from the Early Dynastic Period in Egypt (c. 3150 – c. 2613 BCE) show men and women of the lower class in the same kind of dress: a knee-length, plain kilt, probably white or light in color. This would have been made of cotton, linen, or byssus (flax) and was fastened around the waist by a belt of cloth, papyrus rope, or leather. Upper-class Egyptians in the same time period dressed the same only with more ornamentation. Egyptologist Helen Strudwick observes how “only by their jewelry could men from the wealthy class be distinguished from farmers and artisans” (374). Women’s dress was more distinctive between classes as upper-class women wore a long, figure-fitting dress with or without sleeves. These dresses were held in place by straps over the shoulders and sometimes were supplemented by a sheer tunic worn over them. Egyptian, Dynasty 4, Reign of Khufu, 2551 – 2528 BCE, faience and gold. This beadnet dress is the earliest surviving example of a garment with the lozenge pattern. This pattern is frequently used when depicting women’s clothing in Egyptian art. Although the string had deteriorated, many of the beads were found in their original pattern. It is unclear whether the beadnet dress was sewn into the clothing or worn as a separate net over the linen. Currently housed at the Museum of Fine Arts, Boston, MA. Children of both sexes wore no clothes from birth until puberty and some occupations, as Strudwick notes, continued this practice. The washermen and washerwomen who worked daily by the banks of the Nile River washing other people’s clothing performed their tasks naked because they were in the water so frequently. The First Intermediate Period of Egypt (c. 2181-2040 BCE) followed the collapse of the Old Kingdom and initiated many dramatic changes in the Egyptian culture but fashion remained relatively the same. It is only in the Middle Kingdom of Egypt (2040-1782 BCE) that fashion changes as women begin to wear long cotton gowns and different hairstyles. MIDDLE KINGDOM DRESSES WOULD BE MADE OF A SINGLE SHEET OF CLOTH WHICH THE WOMAN WOULD WRAP HERSELF IN AND THEN ARRANGE FOR STYLE WITH A BELT AROUND THE WAIST OVER WHICH SHE COULD BLOUSE THE TOP. 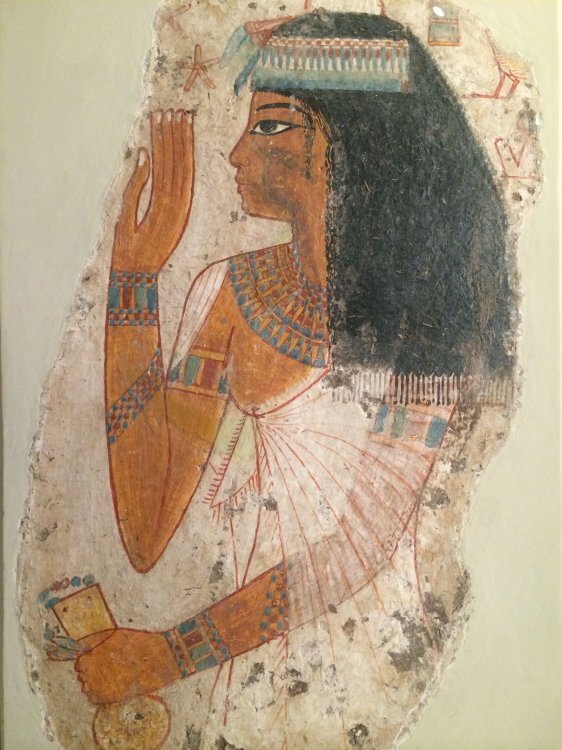 In the Old Kingdom and First Intermediate Period women are depicted with hair length just below their ears while, in the Middle Kingdom, their hair is worn to their shoulders. The Middle Kingdom dress of the upper class is also different in that outfits were often made of cotton. These dresses, still form-fitting, were often sleeved with a plunging neckline ornamented with a clasp necklace at the throat. These dresses would be made of a single sheet of cloth which the woman would wrap herself in and then arrange for style with a belt around the waist over which she could blouse the top. From the same period, however, there is also evidence of upper-class women’s dresses which rose from the ankle to the waist and were held up by thin straps which ran over the breasts and were fastened over the shoulders at the back. Men at this time continued to wear the simple kilt only with pleats at the front. 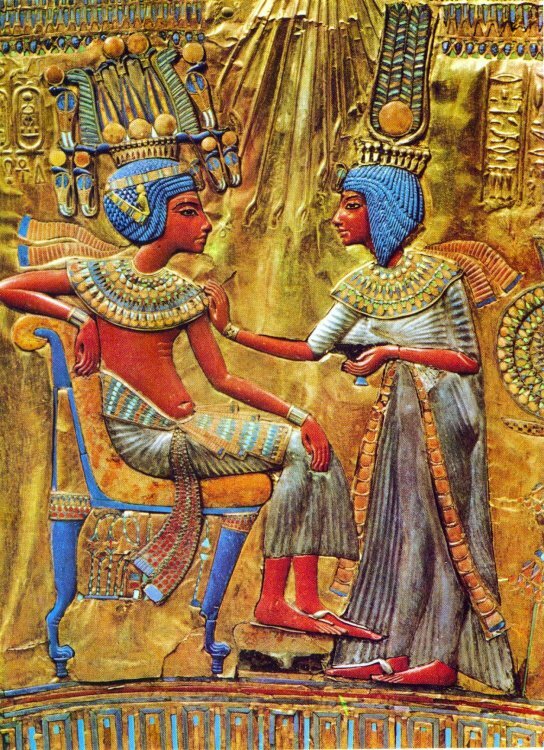 Precisely how the ancient Egyptian pleated their clothing is not known, but images in art clearly show pleats in both men and women’s clothing. The most popular article of clothing among upper-class men was the triangular apron; a starched, ornamented kilt which fell to just above the knees and was held by a sash. This would have been worn over a loincloth which was a triangular strip of cloth running between the legs and tied at the hips. Following the Middle Kingdom, Egypt entered the Second Intermediate Period (c. 1782-1570 BCE) during which the foreign people known as the Hyksos ruled from Lower Egypt and the Nubians held the southern frontiers of Upper Egypt with only Thebes in the middle representing Egyptian rule. The Hyksos gave Egypt many advances, innovations, and inventions which they later made significant use of but do not seem to have contributed to fashion. This is largely because the Hyksos greatly admired Egyptian culture and emulated Egyptian beliefs, behavior, and dress in their cities in the northern Delta. C. 1570 BCE the Theban prince Ahmose I (c. 1570-1544 BCE) drove the Hyksos out of Egypt and initiated the period of the New Kingdom of Egypt (c. 1570-1069 BCE) which saw the greatest advances in fashion in Egyptian history. The fashion styles of the New Kingdom are those most often depicted in films and television shows dealing with Egypt no matter what time period they are set in. 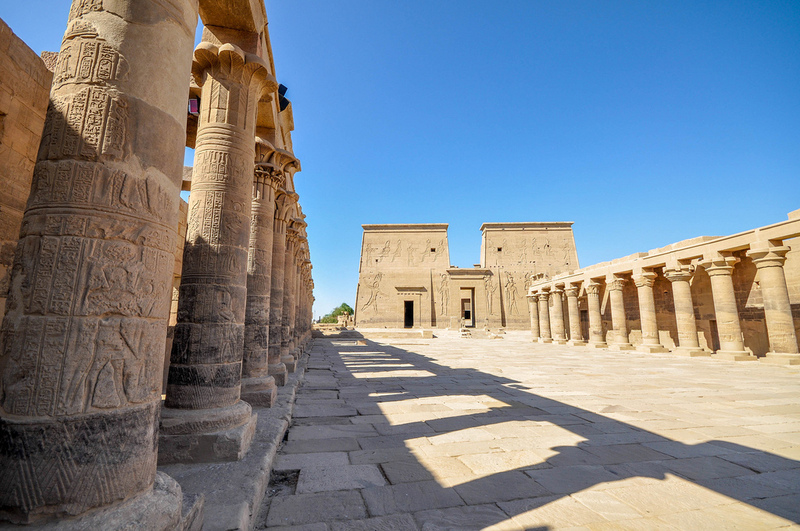 The New Kingdom was the era of Egypt’s empire when the country stepped onto the international stage and came into closer contact with other nations than they had previously. Even before the age of empire, however, fashion statements became more elaborate. Ahmose I‘s wife, Ahmose-Nefertari (c. 1562-1495 BCE), is depicted in a dress with winged sleeves and a wide collar which falls to above her ankles. 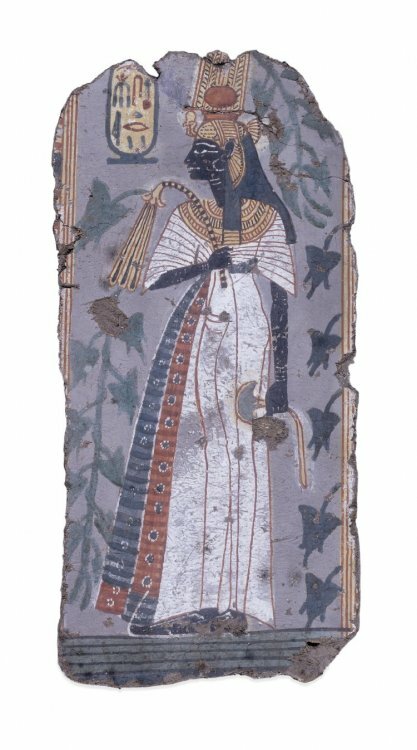 Rectangular fragment of a polychrome tomb-painting representing Ahmose-Nefertari standing among foliage with cartouche above. 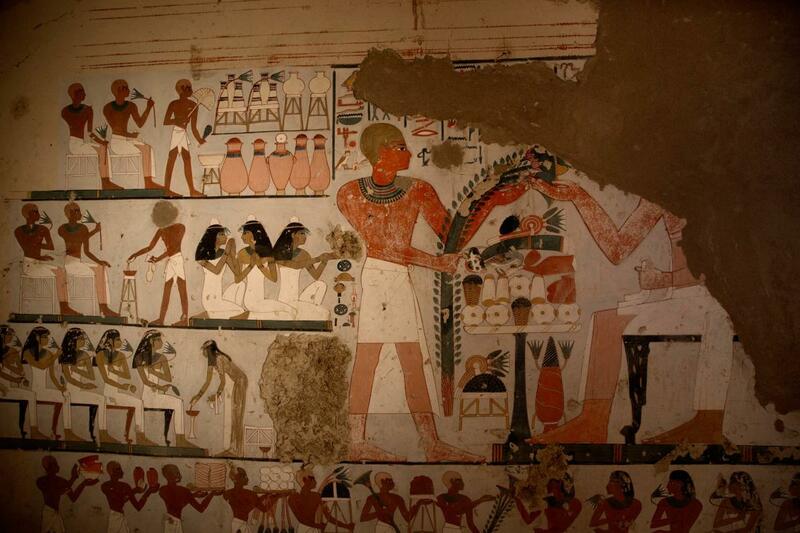 20th Dynasty, Tomb of Kynebu, Thebes, Egypt. 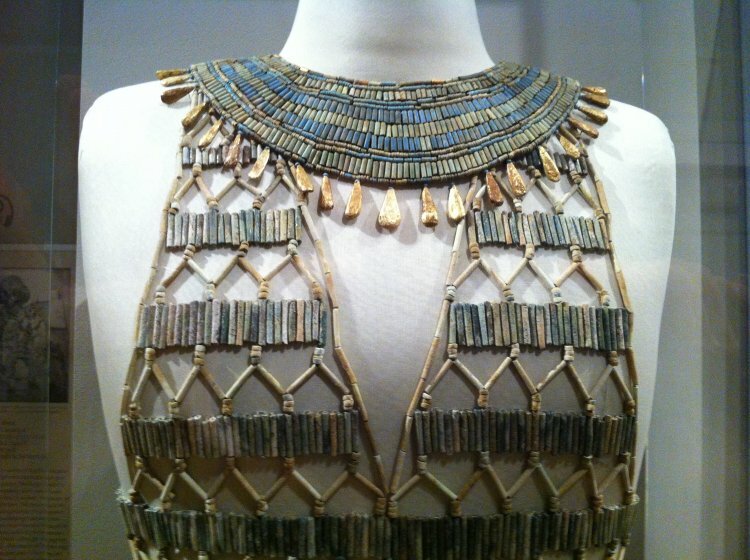 Beaded gowns and dresses (the kalasiris which Herodotus mentions) ornamented with jewels begin to appear in the late Middle Kingdom but become more common in the New Kingdom among the upper classes. Elaborate wigs adorned with beads and jewels also appear with greater frequency at this time. Egyptologist Margaret Bunson notes how “the capelet, made of sheer linen, was the fashion innovation of the New Kingdom” (68). The capelet, or shawl cape, was a rectangle of linen twisted, folded, or cut, and usually attached to an ornamented collar. It was worn over a kalasiris which fell either from the waist or just below the breasts and became the most popular style of the upper classes. Men’s fashion also advanced fairly quickly in the New Kingdom. The kilts of this period drop to below the knee, are more intricately embroidered, and they are often supplemented by a sheer, loose-fitting, blouse. The pharaoh, depicted in the nemes headdress, is often seen in this kind of clothing wearing either sandals or slippers. Bunson notes how men “wore kilts and sheer blouses with elaborately pleated sleeves. Great panels of woven materials hung from the waist and intricate folds were visible under sheer overskirts”. This style was popular with the royalty and upper classes who could afford the material. Underwear was also developed further during this period, evolving from the rough, triangular loincloth wrapped between the legs and around the waist to a finer piece of cloth either sewn to a certain waist size or tied at the hips. Upper-class men’s fashion in the New Kingdom was this underwear beneath a loincloth over which was worn a long sheer shirt falling to the knees, a broad neck piece (for nobility), bracelets, and sandals. King Tutankhamun (c. 1336-c.1327 BCE) was buried with over 100 of this kind of underwear as well as shirts, jackets, kilts, and cloaks, providing some of the best examples of New Kingdom fashion yet found. Women’s fashion from the period was more elaborate than in any previous era. Men and women of Egypt often shaved their heads to prevent lice and to cut down on the time it would take to maintain a full head of hair. Wigs were used by both sexes to protect the scalp and for ceremonial purposes. The wigs of the New Kingdom are the most ornate, especially for women, and show pleated, fringed, and layered hair styles with a length to the shoulders or below. Sheer gowns of light linen were in favor among the upper-class women, often ornamented with a sash or cape, belted at the waist, and accented by a headpiece, necklace, and earrings. Different professions also adopted fairly consistent styles of fashion. Viziers, for example, wore a long skirt (often embroidered) which fastened under the arms and fell to the ankles along with sandals or slippers. Scribes wore the simple waist-to-knee kilt and are sometimes seen in a sheer blouse. Priests wore white linen robes and, according to Herodotus, could wear no other color as white symbolized purity and the sacred. Soldiers, guards, and police forces also wore the simple kilt with sandals and sometimes wrist guards. Farmers, brewers, tavern keepers, masons, laborers, and merchants are uniformly depicted from this period in the same simple kilt, both male and female, though the merchant sometimes appears in a robe or a cloak. Coats, jackets, and cloaks were common throughout Egypt’s history as the temperature at night, and especially in the rainy season, could be quite cold. Perfume and jewelry were appreciated and worn by both men and women, as were cosmetics. Egyptians of both sexes used kohl under their eyes to decrease sun glare and kyphi, the most popular Egyptian perfume, was regarded so highly it was burned as incense in the temples. Images of Egyptians with cones on their heads are depicting the use of kyphi in its cone form. It was composed of frankincense, myrrh, pine resin, and other ingredients and could be burned (as with the cones), applied to the skin, or used as toothpaste and mouthwash. Kyphi was most often used by women and applied in very much the same fashion as perfume is in the modern day. A woman, or her maidservant, would open a container of kyphi, fan the air, and walk through the scent. The same is true of cosmetics, which were kept in pots or jars and applied from these containers with a brush or reed, much like the modern eyeliner. Footwear was practically non-existent among the lower classes, but in cold weather or rough terrain, they seem to have wrapped their feet in rags. Among the upper classes sandals and slippers were worn but, like the lower classes, people usually went barefoot. 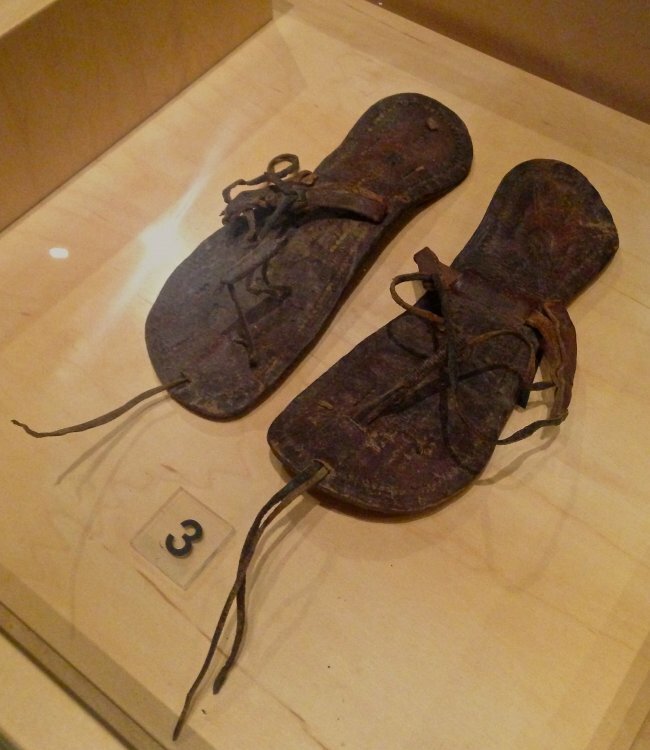 Sandals were made of wood, papyrus, leather, or a combination of these and were fairly expensive. Tutankhamun‘s tomb contained 93 pairs of sandals in different styles and one even of gold. Slippers were made of papyrus rushes woven together but could be supplemented with cloth interiors. Dating to 400-600 C.E., this pair of sandals features extensive leather-tooled decoration on the footbed, a design detail would have only been appreciated when the sandals were removed. There is some evidence of shoes being worn by nobility in the New Kingdom and also the use of silk but this is rare. The Hittites had developed the shoe and the boot by this time, so it would not be surprising to see their appearance in Egypt. In 1258 BCE the Hittites and Egyptians signed the world’s first peace treaty, and afterwards cultural diffusion was common between the two. Still, the shoe never became popular footwear in Egypt as it would probably have been considered unnecessary effort; after all, even the gods went barefoot. 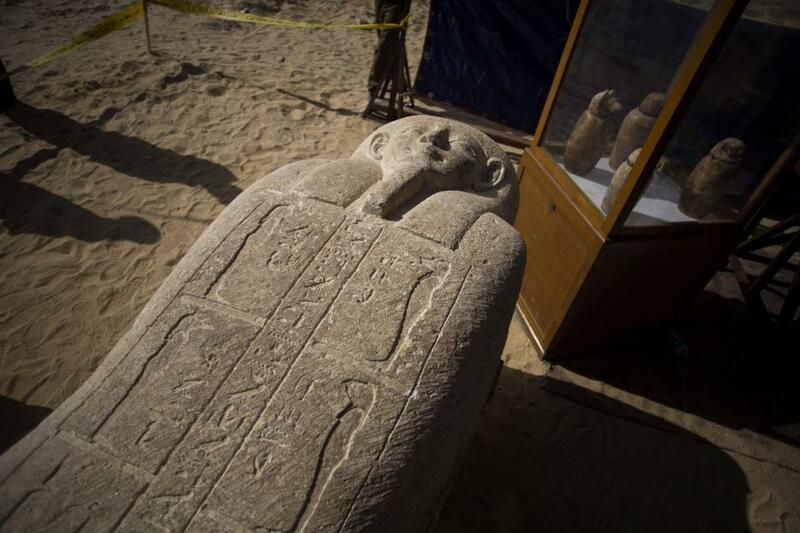 3,500-Year-Old Tombs Uncovered in Egypt. One Has a Mummy. The final resting places of two ancient officials contain colorful grave goods, an elaborate mural, and linen-wrapped human remains. Luxor., EGYPT. 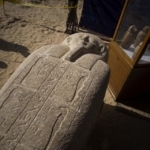 Egyptian officials today announced the discovery and excavation of two tombs found in the necropolis of Dra’ Abu el-Naga in Luxor. 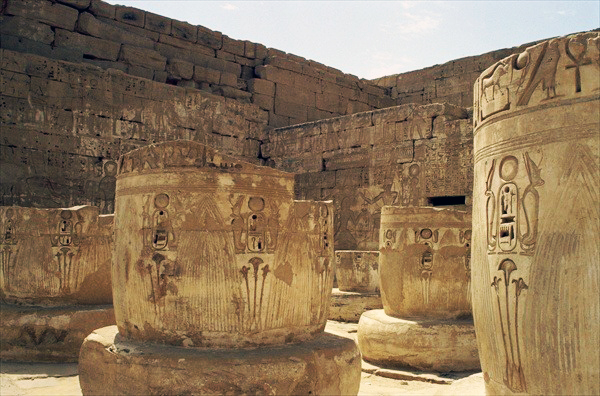 The tombs, dated to the 18th Dynasty (1550-1292 B.C.) 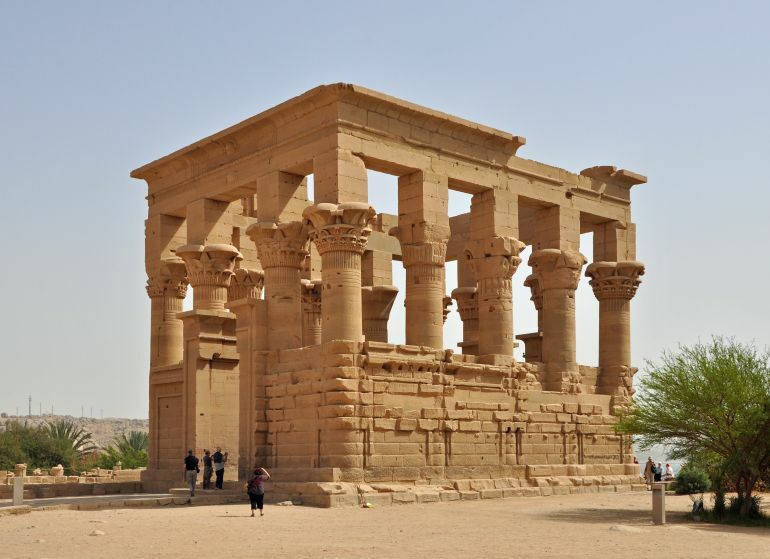 belonged to officials who likely served here at the ancient capital of Thebes, now a UNESCO world heritage site. 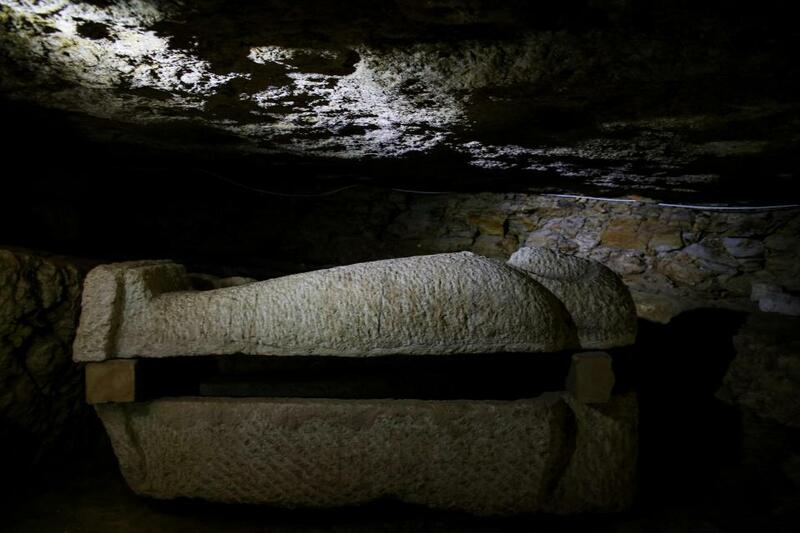 The names of the officials buried in the tombs remains unknown, as no inscriptions bearing the names of the tombs’ occupants have yet been found. 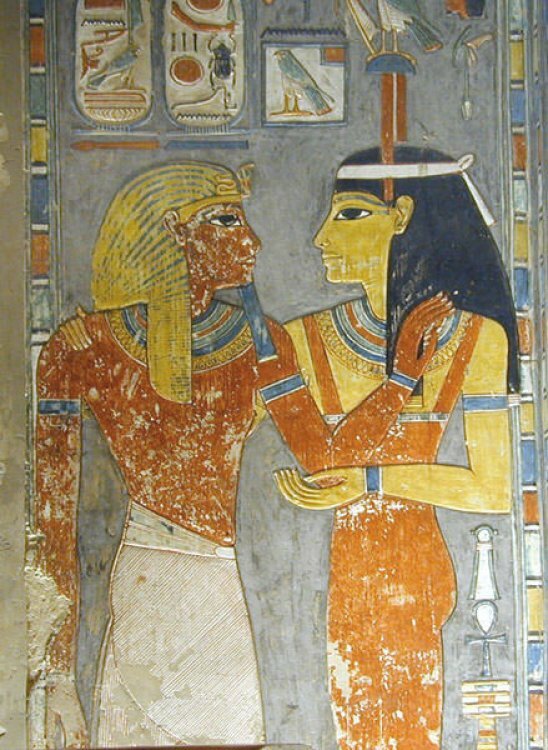 In April, the tomb of an 18th Dynasty magistrate named Userhat was discovered in the same necropolis. BANQUET FOR THE DEAD?A mural depicts an individual presenting offerings to the deceased, right, in the ancient Egyptian tomb known as Kampp 161. Kampp 161 likely dates to the reigns of Amenhotep II or Thutmose IV, based on stylistic and architectural comparisons with other tombs in the area, making it around 3,400 years old. The western wall of the tomb features an elaborate depiction of a social event, possibly a banquet, with a figure presenting offerings to the tomb’s occupant and his wife. 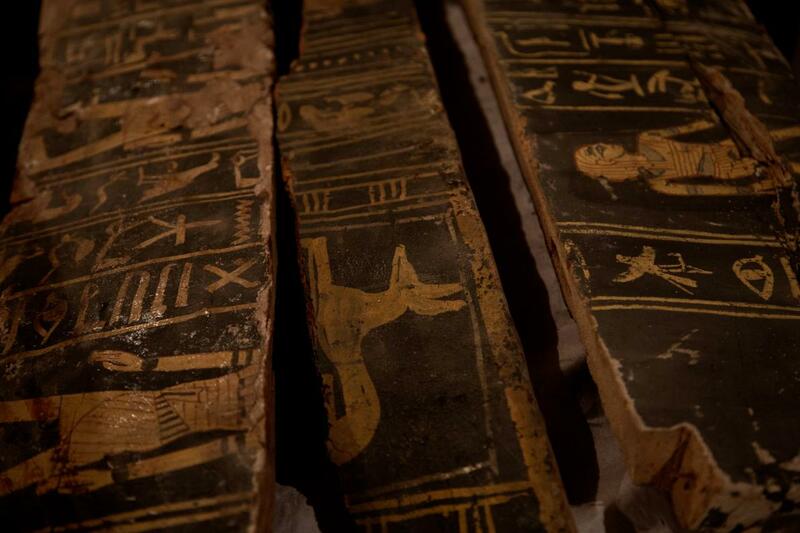 Wooden funerary masks, the remains of furniture, and a decorated coffin were discovered in the tomb. 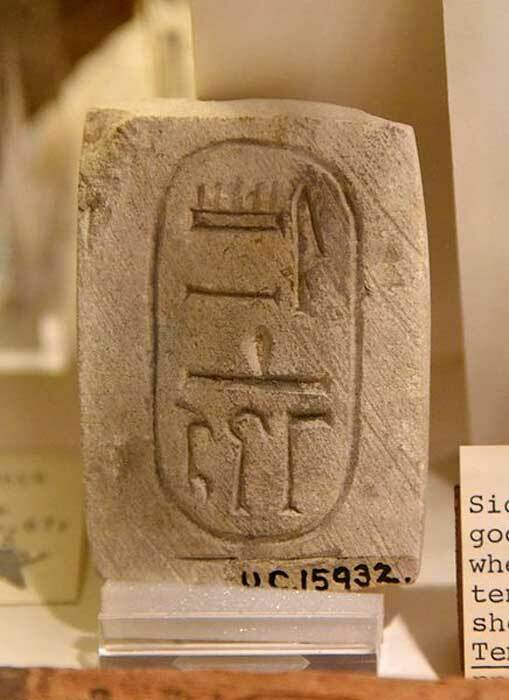 Kampp 150 most likely dates to the reign of Thutmose I—roughly a century earlier than Kampp 161—based on a cartouche found in the tomb. While no name-bearing inscription was found, many funerary seals bearing the names of a writer named Maati and his wife Mohi, found in the tomb’s courtyard, may hint at the identification of the tomb’s occupant. 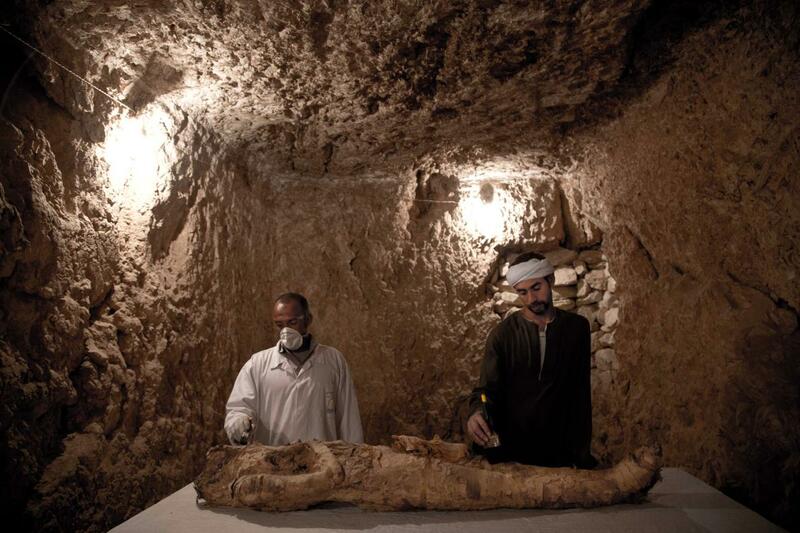 Archaeologists found colorful wooden statues, funerary masks and a linen-wrapped mummy in the tomb. 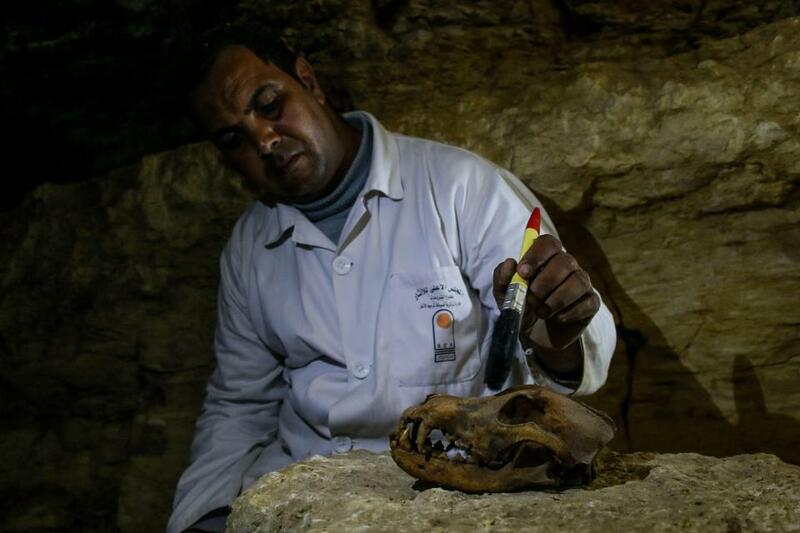 While foreign archaeological expeditions have had a long history in the excavation of Egypt’s ancient sites, a senior official with the Ministry of Antiquities noted that the re-discovery and excavation of the tombs by Egyptian archaeologists reflect the growing professionalism and expertise of the country’s native scientific community. Seshat (also given as Sefkhet-Abwy and Seshet) is the Egyptian goddess of the written word. Her name literally means “female scribe” and she is regularly depicted as a woman wearing a leopard skin draped over her robe with a headdress of a seven-pointed star arched by a crescent in the form of a bow. This iconography has been interpreted as symbolizing supreme authority in that it is common in Egyptian legend and mythology for one to wear the skin of a defeated enemy to take on the foe’s powers, stars were closely associated with the realm of the gods and their actions, and the number seven symbolized perfection and completeness. The leopard skin would represent her power over, and protection from, danger as leopards were a common predator. The crescent above her headdress, resembling a bow, could represent dexterity and precision, if one interprets it along the lines of archery, or simply divinity if one takes the symbol as representing light, along the lines of later depictions of saints with halos. A relief from the back of the throne of a seated statue of Ramesses II depicting the Egyptian goddess of writing Seshat. 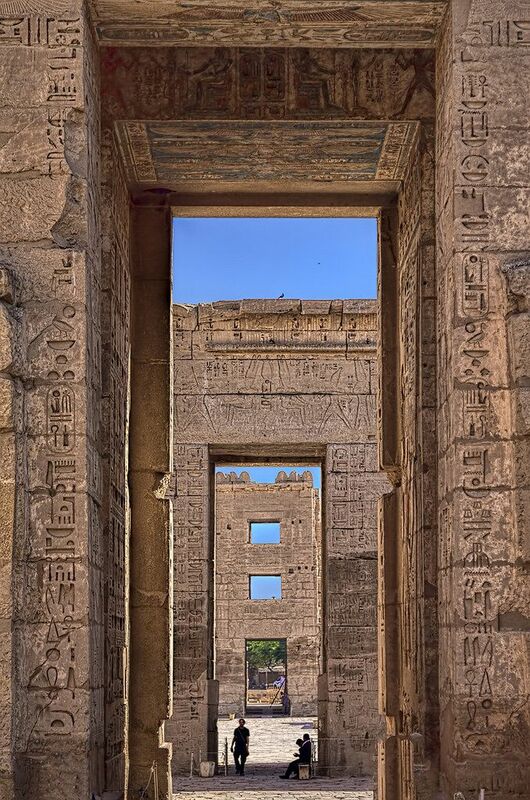 13th century BCE, Luxor Temple, Egypt. Among her responsibilities were record keeping, accounting, measurements, census-taking, patroness of libraries and librarians, keeper of the House of Life (temple library, scriptorium, writer’s workshop), Celestial Librarian, Mistress of builders (patroness of construction), and friend of the dead in the afterlife. She is often depicted as the consort (either wife or daughter) of Thoth, god of wisdom, writing, and various branches of knowledge. She first appears in the 2nd Dynasty (c. 2890- c. 2670 BCE) of the Early Dynastic Period (c. 3150 – c. 2613 BCE) as a goddess of writing and measurements assisting the king in the ritual known as “stretching of the cord” which preceeded the construction of a building, most often a temple. The ancient Egyptians believed that what was done on earth was mirrored in the celestial realm of the gods. The daily life of an individual was only part of an eternal journey which would continue on past death. Seshat featured prominently in the concept of the eternal life granted to scribes through their works. When an author created a story, inscription, or book on earth, an ethereal copy was transferred to Seshat who placed it in the library of the gods; mortal writings were therefore also immortal. 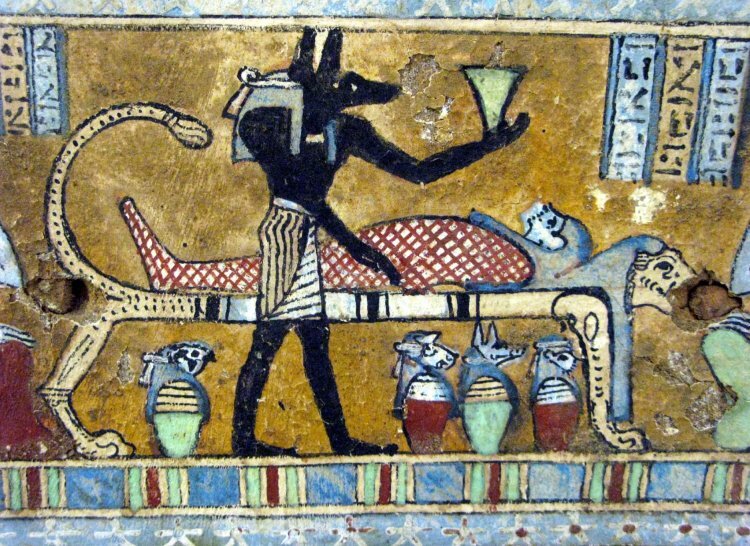 Seshat was also sometimes depicted helping Nephthys revive the deceased in the afterlife in prepration for their judgment by Osiris in the Hall of Truth. In this capacity, the goddess would have helped the new arrival recognize the spells of The Egyptian Book of the Dead, enabling the soul to move on toward the hope of paradise. 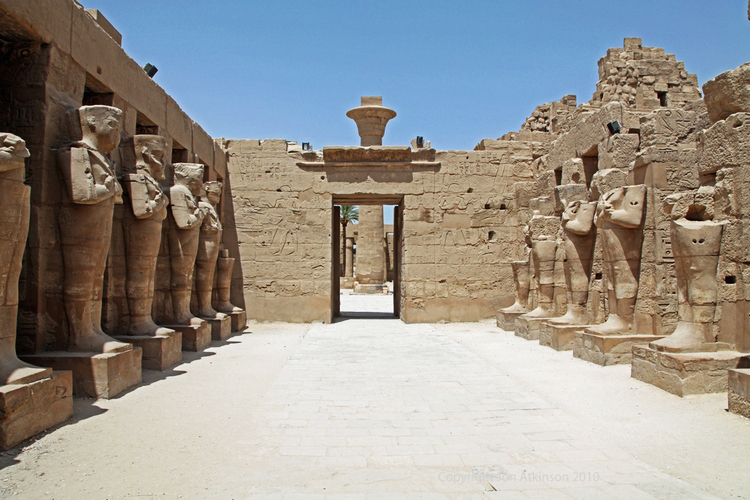 Unlike the major gods of Egypt, Seshat never had her own temples, cult, or formal worship. Owing to the great value Egyptians placed on writing, however, and her part in the construction of temples and the afterlife, she was venerated widely through commonplace acts and daily rituals from the Early Dynastic Period to the last dynasty to rule Egypt, the Ptolemaic Dynasty of 323-30 BCE. 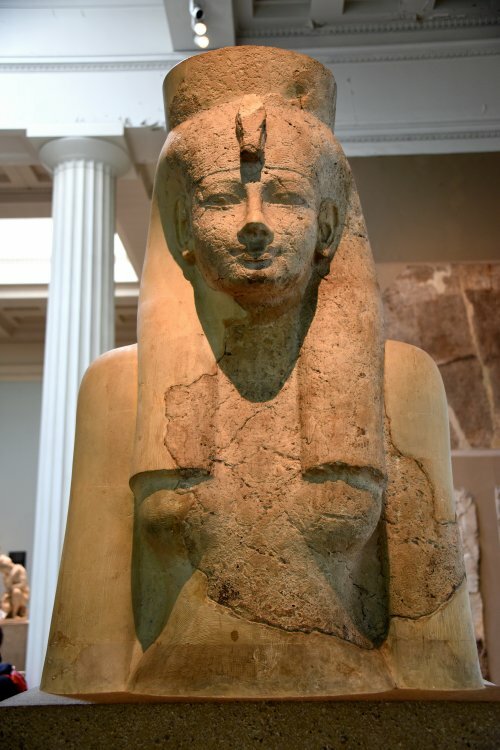 Seshat is not as well known today as many of the other deities of ancient Egypt but, in her time, she was among the most important and widely recognized of the Egyptian pantheon. According to one myth, the god Thoth was self-created at the beginning of time and, in his form as an ibis, lay the primordial egg which hatched creation. There are other versions of Thoth’s birth as well but they all make mention of his vast knowledge and the great gift of writing he offered to humanity. Thoth was worshipped as early as the Pre-Dynastic Period (c. 6000- c. 3150 BCE) at a time when Egyptian writing consisted of pictographs, images representing specific objects, prior to their development into hieroglyphics, symbols representing sounds and concepts. At this time, Thoth seems to have been considered a god of wisdom and knowledge – as he remained – and once a writing system was developed it was attributed to him. 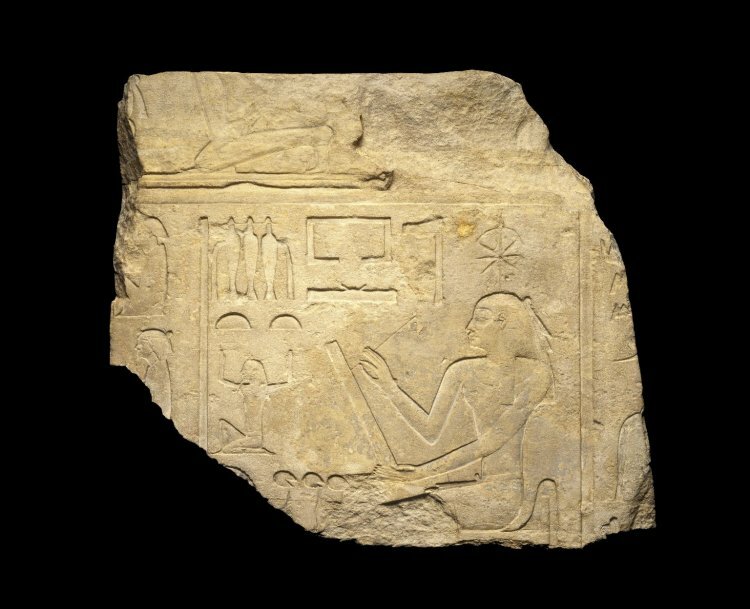 A limestone relief slab depicting Seshat, the Egyptian goddess of writing. ca. 1919-1875 BCE. (Brooklyn Museum, USA). AMONG SESHAT’S RESPONSIBILITIES WERE RECORD KEEPING, ACCOUNTING, MEASUREMENTS, CENSUS-TAKING, AND PATRONESS OF LIBRARIES & LIBRARIANS. Representations show the king involved in a foundation ritual known as “stretching the cord” which probably took place before work began on the construction of a temple or of any addition. These depictions usually show the king performing the rite with the help of Seshat, the goddess of writing and measurement, a mythical aspect which reinforced the king’s central and unique role in the temple construction (Symbol & Magic, 174). Seshat’s responsibilities were many. As record-keeper she documented everyday events but, beginning in the Middle Kingdom (c. 2613-c. 2181 BCE), she also recorded the spoils of war in the form of animals and captives. She also kept track of tribute owed and tribute paid to the king and, beginning in the New Kingdom (c. 1570-1069 BCE), was closely associated with the pharaoh recording the years of his reign and his jubilee festivals. Egyptologist Rosalie David notes how she “wrote the king’s name on the Persea tree, each leaf representing a year in his allotted lifespan” (Religion and Magic, 411). Throughout all these periods, and later, her most important role was always as the goddess of precise measurements and all forms of the written word. The Egyptians placed great value on attention to detail and this was as true, if not more so, in writing as any other aspect of their lives. The main purpose of writing was not decorative and it was not originally intended for literary or commercial use. Its most important function was to provide a means by which certain concepts or events could be brought into existence. The Egyptians believed that if something were comitted to writing it could be repeatedly “made to happen” by means of magic (Handbook,199). The spells of The Egyptian Book of the Dead are the best examples of this concept. The Book of the Dead is a guide through the afterlife written for the deceased. The spells the soul speaks help one to navigate through assorted dangers to arrive at the perfect paradise of the Field of Reeds. One needed to know how to avoid demons, how to transform one’s self into various animals, and how to address the entities one would meet in the next world and so the spells had to be precise in order to work. The Book of the Dead evolved from the Pyramid Texts of the Old Kingdom but, even before this time, one can see the Egyptian precision in writing at work in the Offering Lists and Autobiographies of tombs in the latter part of the Early Dynastic Period. Writing, as David notes, could bring concepts or events into existence – from a king’s decree to a mythological tale to a law, a ritual, or an answered prayer – but it also held and made permanent that which had passed out of existence. Writing made the transitory world of change into one everlasting and eternal. The dead were not gone as long as their stories could be read in stone; nothing was ever really lost. 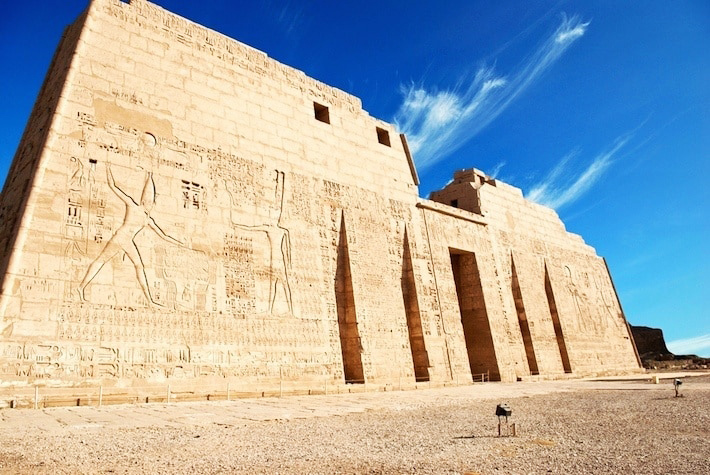 The sacred carvings of the Egyptians were so important to them that they dedicated whole sections of temples or temple complexes to a literary institution known as The House of Life. Research was conducted in the House of Life because medical, astronomical, and mathematical texts perhaps were maintained there and copied by scribes. The institution served as a workshop where sacred books were composed and written by the ranking scholars of the times. It is possible that many of the texts were not kept in the Per-Ankh but discussed there and debated. The members of the institution’s staff, all scribes, were considered the learned men of their age. Many were ranking priests in the various temples or noted physicians and served the various kings in many administrative capacities (204-205). The scribes were most commonly associated with the sun god Ra in earlier times and with Osiris in later periods no matter which god resided in a particular temple. Bunson claims that probably only very important cities could support a Per-Ankh but other scholars, Rosalie David among them, cite evidence that “every sizable town had one” (Handbook, 203). Bunson’s theory is substantiated by the known structures identified as a Per-Ankh at Amarna, Edfu, and Abydos, all important cities in ancient Egypt, but this does not mean there were not others elsewhere; only that these have not been positively identified as yet. 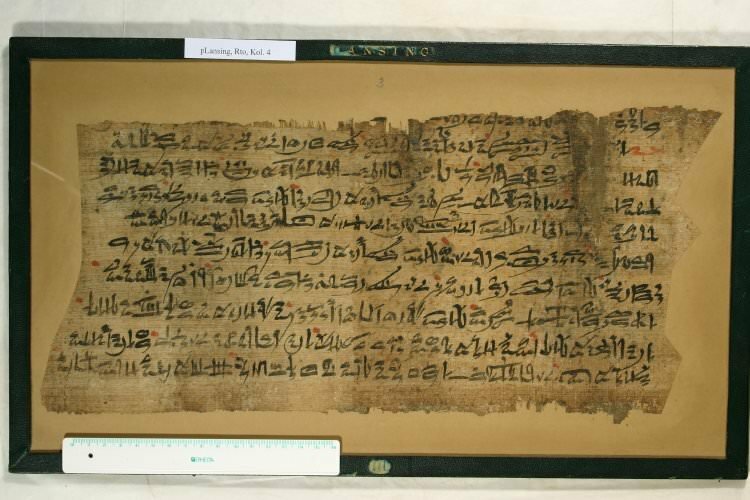 The Papyrus Lansing is an anthology of texts praising the profession of the scribe, dating to the New Kingdom of Egypt. It would seem that the House of Life had both a practical use and a deeply religious significance. Its very title may reflect the power of life that was believed to exist in the divinely inspired writings composed, copied, and often stored there…In one ancient text the books in the House of Life are claimed not only to have the ability to renew life but actually to be able to provide the food and sustenance needed for the continuation of life (Handbook, 203-204). It is a certainty that the majority of the priests and scribes of the Per-Ankh were men but some scholars have pointed to evidence for female scribes. 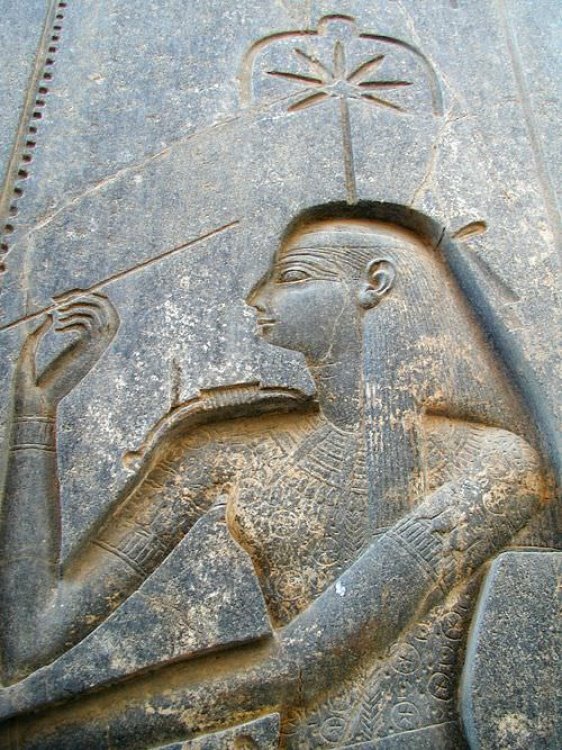 Since Seshat was herself a divine female scribe it would make sense that women practiced the art of writing as well as men. Although the only Egyptian woman to be depicted actually putting pen to paper was Seshat, the goddess of writing, several ladies were illustrated in close association with the traditional scribe’s writing kit of palette and brushes. It is certainly beyond doubt that at least some of the daughters of the king were educated and the position of private tutor to a royal princess could be one of the highest honour. In a few New Kingdom scenes, women are depicted with scribal kits under their chairs and it has been suggested that the women were commemorating their ability to read and write. Unfortunately, in all cases but one, the woman is sitting with her husband or son in such a way that it would cramp the available space to put the kit under the man’s chair, and so it may have been moved back to a place under the woman’s. This happens in a similar scene when the man’s dog is put under the woman’s chair. So one cannot be sure that the scribal kit belonged to the woman. If there was a large group of literate women in ancient Egypt, they do not seem to have developed any surviving literary genres unique to themselves (113). While this may be true, one cannot discount the possibility that female scribes were responsible for works of literature, either in creating or copying them. Egyptian society was quite conservative and written works generally adhered to a set structure and theme throughout the various periods of history. Even in the New Kingdom, where literature was more cosmopolitan, literature still adhered to a basic form which elevated Egyptian cultural values. Arguing that there were few female scribes based on there being no “women’s literature” in ancient Egypt seems in error as the literature of the culture could hardly be considered “masculine” in any respect save for the kings’ monumental inscriptions. In the famous story of Osiris and his murder by Set it is not Osiris who is the hero of the tale but his sister-wife Isis. 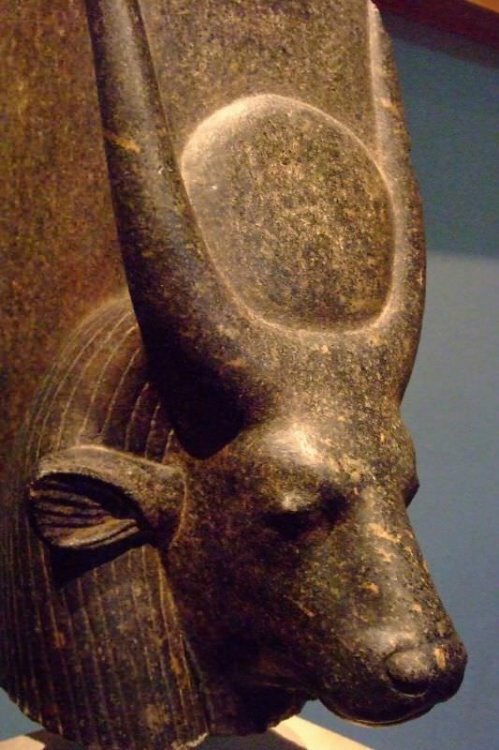 Although the best-known creation myth features the god Atum standing on the ben-ben at the beginning of time, an equally popular one in Egypt has the goddess Neith creating the world. Bastet, goddess of the hearth, home, women’s health and secrets, was popular among both men and women and the goddess Hathor was regularly invoked by both at festivals, parties, and family gatherings. The deity who presided over the brewing of beer, the most popular drink in Egypt, was not male but the goddess Tenenet and the primary protector and defender of Isis when she was a single mother safe-guarding Horus was the goddess Serket. Seshat is only one of a number of female deities venerated in ancient Egypt reflecting the high degree of respect given to women and their abilities in a number of different areas of daily life. The rite involved the careful orientation of the temple by astronomical observation and measurement. Apparently this was usually accomplished by sighting the stars of a northern circumpolar constellation through a notched wooden instrument called a merkhet and thus acquiring a true north-south orientation which was commonly used for the temple’s short axis. 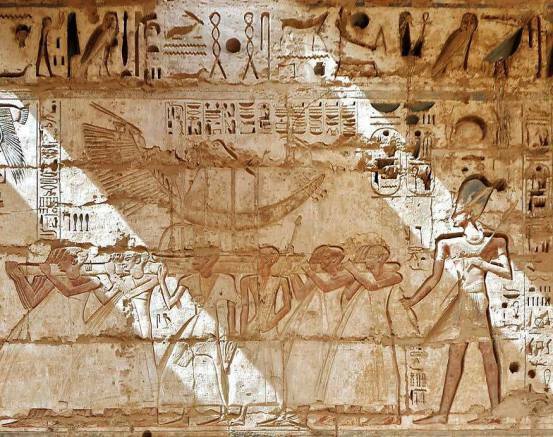 According to the texts, the king was assisted in this ritual by Seshat (or Sefkhet-Abwy), the scribal goddess of writing and measurement (Temples, 38). 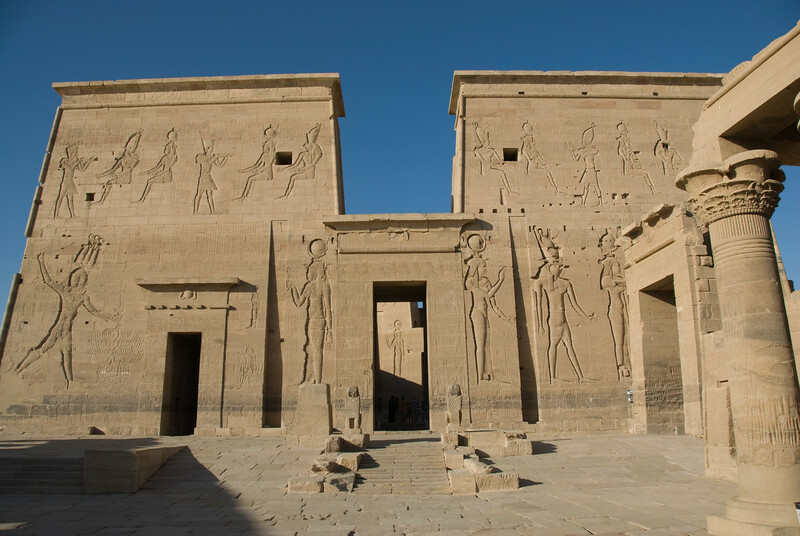 In addition to setting the foundation of the temple, Seshat also was responsible for the written works that temple produced and housed in its House of Life and, further, for gathering these works into her eternal library in the realm of the gods. Although Thoth was responsible for the initial gift of writing, his consort Seshat lovingly gathered the works that gift produced, presided over them in the libraries on earth, and kept them eternally safe on her shelves in the heavens. As writing was both a creative and preserving art, one which brought concepts to life and caused them to endure, which bestowed eternal life on both the writer and the subject, Seshat would be considered by the ancient Egyptians as the goddess responsible for the preservation of Egyptian culture and its enduring fascination among the people of the present day. 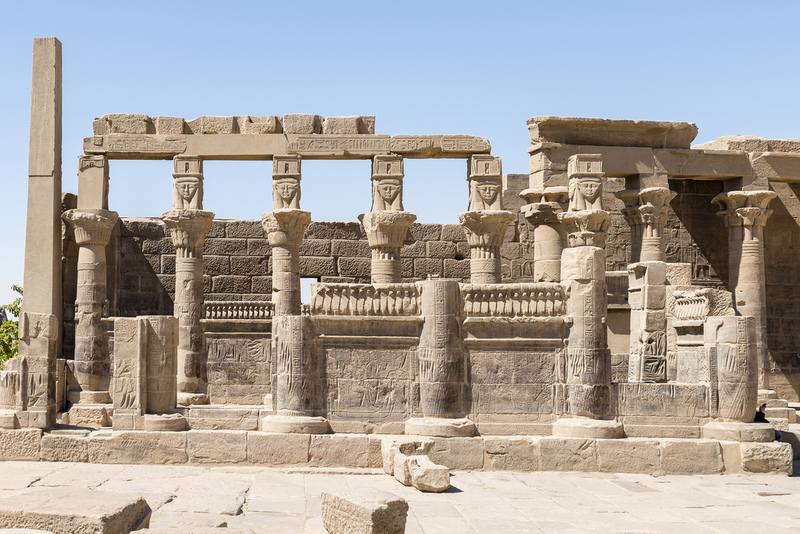 Built atop the 3,000-year-old Tombs of the Nobles, Qurna, a village located on the West Bank of the Nile, is one of the most important archaeological sites in Egypt, but it is also one of the most controversial. For nearly a century, the Egyptian government had wanted the citizens of Qurna out. 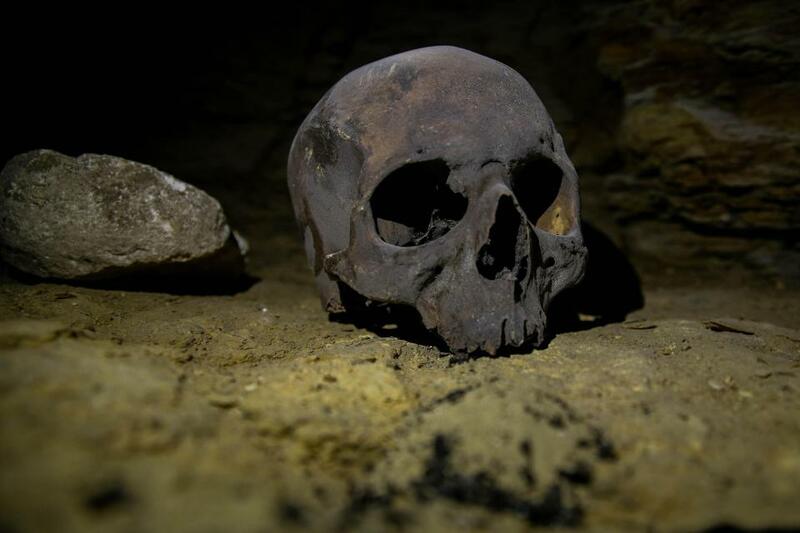 Not only were they living on top of and within ancient tombs, they were also secretly looting priceless treasures, and making it impossible for excavations to take place. In 2006, the villagers were given their marching orders. 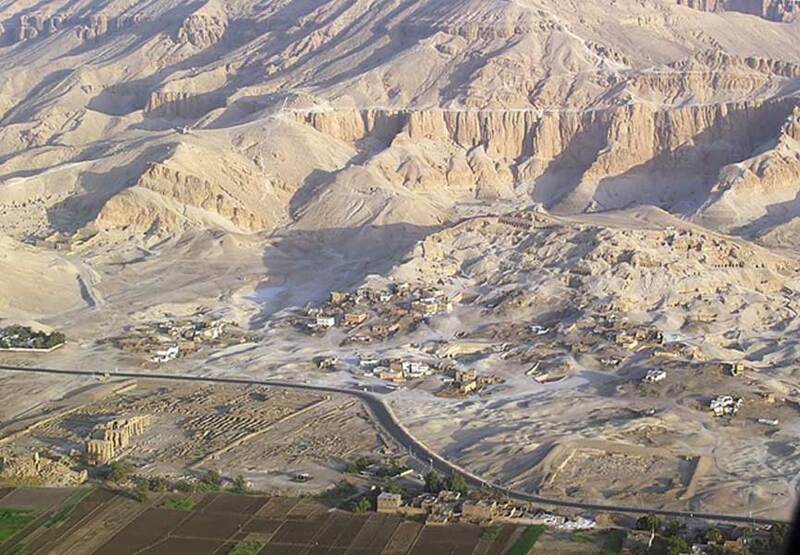 The significant problem posed by Qurna, in which a settlement had been built on top of an extremely important archaeological site, was first realized in the early 1900s. It is known from travelers’ accounts that the village of Qurna (aka. Kurna, Gourna) was already in existence since at least the 1800s. However, by the early-20 th century, it became apparent that not only were people living on top of pharaonic tombs, and in some cases inside them, but some villagers were looting tombs, which they could access beneath their homes, and selling off important artifacts. As soon as the Egyptian government became aware of what was taking the place, the started a plan to evict the villagers from their settlement. 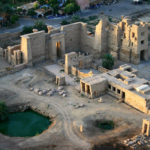 The Egyptian government had planned to relocate the villagers of Qurna to a new settlement known as New Qurna. The man responsible for designing and building New Qurna was a famous Egyptian architect by the name of Hassan Fathy. The work began in 1946, and was completed six years later. Fathy’s philosophy behind this new village was as follows: “with the aid of local materials and techniques, sustainable human development and social cohesion can be met with vernacular architecture”. Proponents of the relocation provide several reasons as to why this was necessary. One of these, for example, is that the mud-brick houses of the villagers are an obstacle to the archaeological work that could potentially be carried out there. 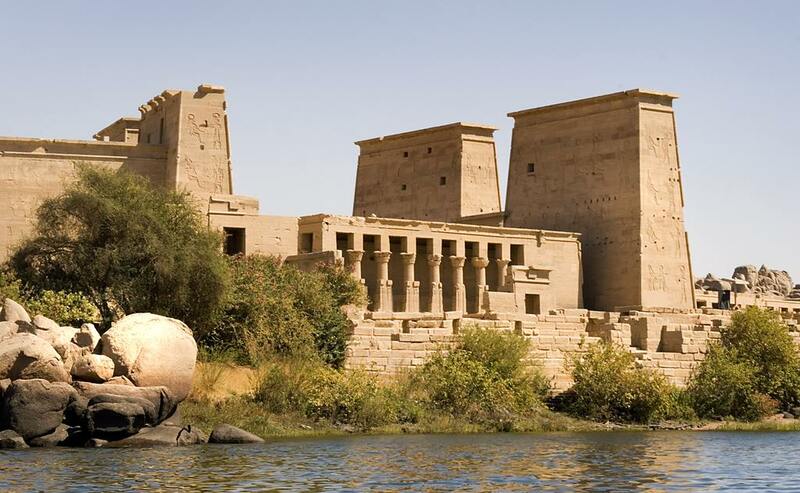 As an example, there are about 100 tombs, collectively known as the ‘Tombs of the Nobles’, which are sunk deep into the hillside located in this area of the Nile. Due to the houses of the villagers, however, it was not possible for archaeologists to excavate them. 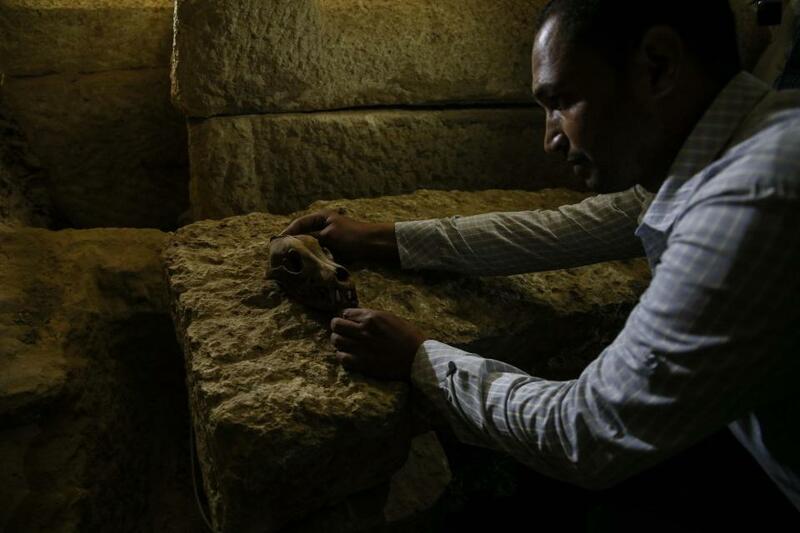 During the late 18th and early 19th centuries, European Egyptologists were excavating in that area, as it was already known to be full of tombs belonging to ancient Egyptian nobles. These Egyptologists needed workmen for their excavations, which naturally attracted locals to settle in the area. 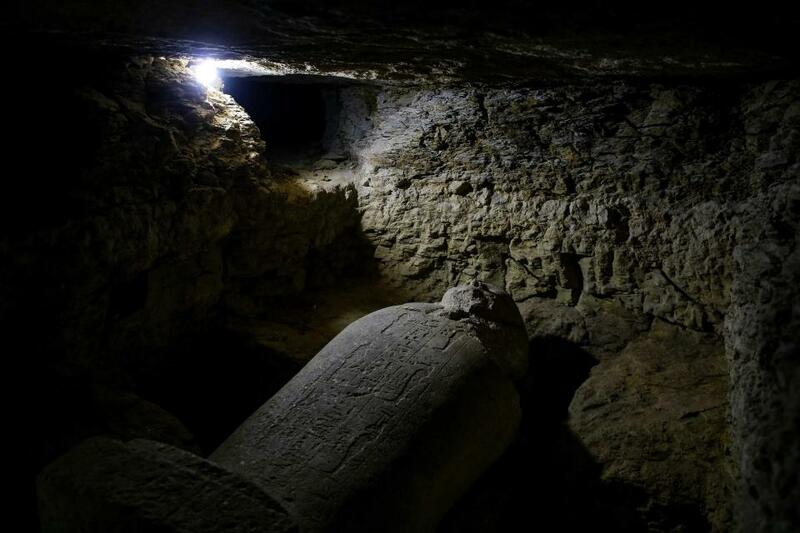 Some of the discoveries made thanks to the labor of these workmen include the tombs of Nakht (a scribe of the granaries during the reign of Thutmose IV), Rekhmire (a vizier serving under Thutmose III, and Amenhotep II), and Menna (a scribe in the service of Thutmose IV). 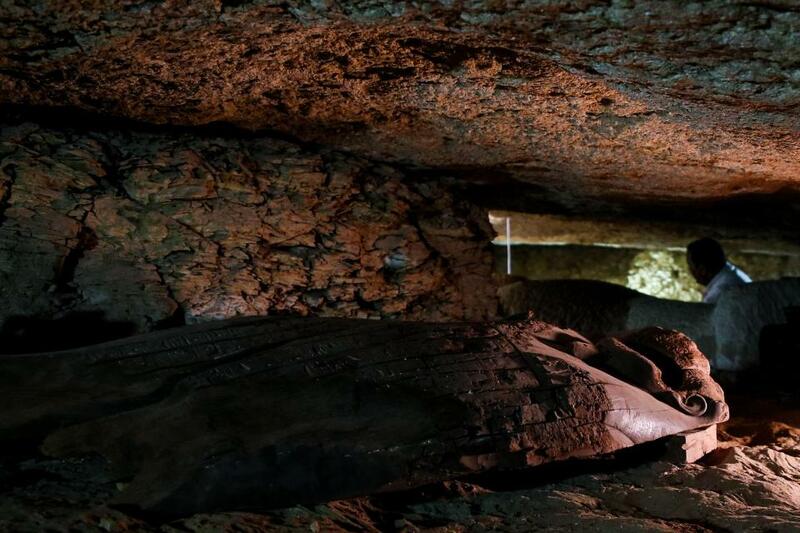 The unearthing of these tombs also resulted in the arrival of tourists to the site. As a consequence of this, the villagers of Qurna were presented with another source of income. 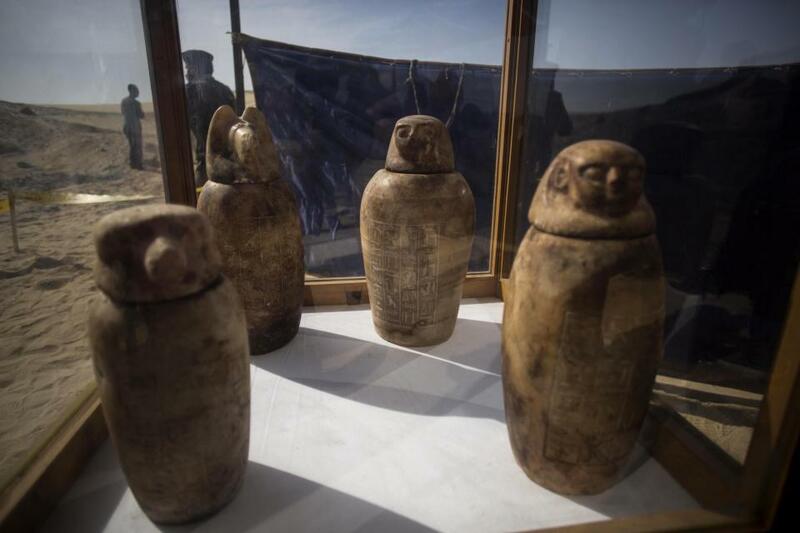 Apart from serving as tour guides, the people of Qurna also began to make fake artifacts/forgeries to sell to tourists seeking to take home pieces of ancient Egypt with them as souvenirs. These objects bear such a strong resemblance to the real thing that it is often difficult to distinguish the real from the fake. The villagers of Qurna have also often been accused of looting the tombs in order to sell the artifacts on the black market. This unsavory reputation was first given to the villagers by European tourists during the 18th century (for the sole reason that they looked poor and forbidding) and has survived to this day. 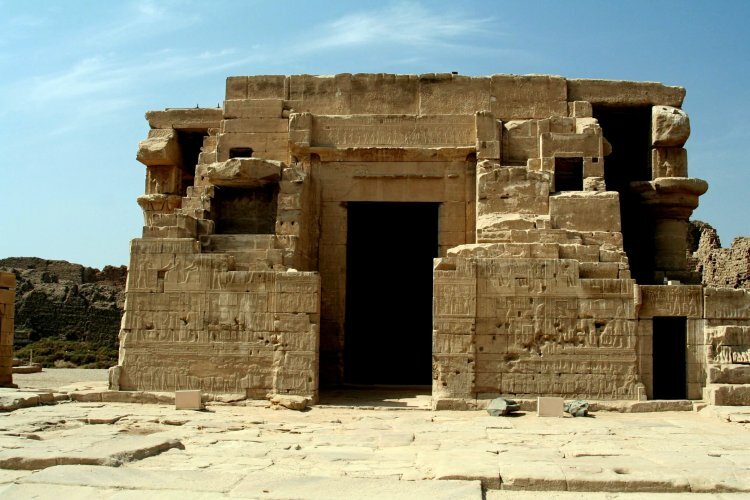 Thus, another argument in favor of relocating the villagers of Qurna is that it would help protect the tombs from further looting. Sources: ancient-origins.net, images attributed in the captions respectively.